– Fascinating dynamics, state-of-the-art technology, stunning design matched with compelling efficiency and perfect everyday usability – the new Leon CUPRA embodies the SEAT brand values in the best possible way. With up to 206 kW / 280 PS, the new CUPRA is not only the clear top model in the very successful Leon family, it is also the brand’s most powerful series-production car, and the fastest. The drive and the chassis of the Leon CUPRA guarantee precision driving fun of the highest order. With its extensive equipment and excellent quality, the new CUPRA offers exceptionally good value-for-money. 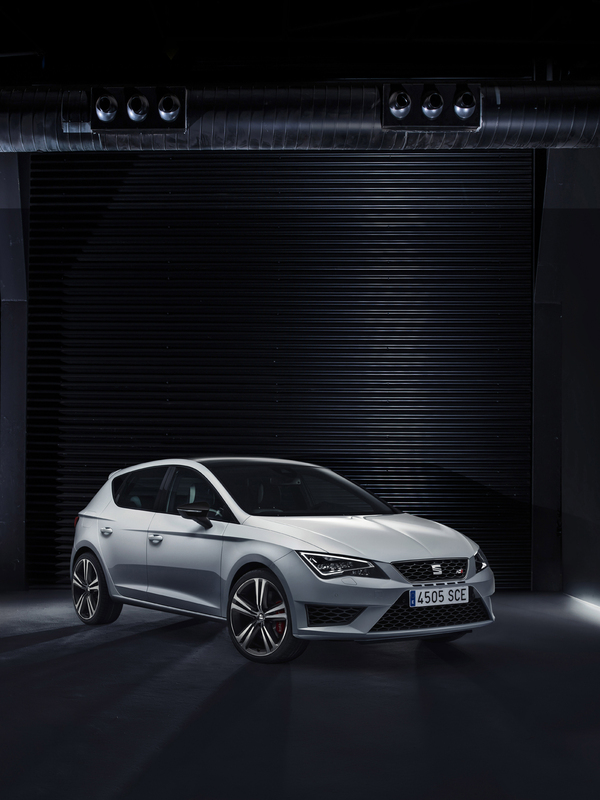 Right from the start, the Leon CUPRA will be offered as a five-door and as the Leon SC CUPRA Sport Coupé with three doors. A concentrated package of hi-tech guarantees the enormous performance of the new CUPRA. At the top is the all-new 2.0 TSI engine with dual injection and variable camshaft timing. Depending on the version, it delivers an output of 195 kW / 265 PS or 206 kW / 280 PS. The DCC dynamic chassis control, the front differential lock, the progressive steering, the CUPRA Drive Profile and the standard-fit full-LED headlamps are further examples of its state-of-the-art technologies. With the new Leon CUPRA, a success story is moving onto the next level. The first generation was launched in 1996 with the Ibiza, since when the dynamic CUPRA models have developed to become the icons of the SEAT brand. Now CUPRA comes as a 3-door Leon for the first time. CUPRA stands for power, performance, dynamics – and the new Leon CUPRA fulfils all these promises perfectly. The CUPRA 280 with optional DSG transmission, the brand’s top model catapults from zero to 100 km/h in just 5.7 seconds, and in 5.8 seconds with the manual gearbox (Leon SC). The regulated top speed of 250 km/h is a matter of course. The maximum torque of 350 Newton metres across the wide range of 1,750 to 5,300 rpm guarantees impressive pulling power in every situation. And the CUPRA with 195 kW / 265 PS and a maximum torque of 350 Newton metres is no more than a fraction slower. Its acceleration time stands at 5.9 seconds with manual transmission and 5.8 seconds with DSG (Leon SC). Against this, the new Leon CUPRA is astonishingly efficient. The average fuel consumption for both power variants is just 6.4 litres with DSG (Leon 5D: 6.6) and 6.6 litres with the manual gearbox. This equates to CO2figures of just 149 and 154 grams. And, compared with its predecessor, it means a reduction in emissions of 51 grams. As a true sports engine, the 2.0 TSI reacts spontaneously to every movement of the gas pedal and is deliciously high revving – paired with a rich and refined sound that is aided and modulated by a sound actuator. The all-new power unit with its exceptionally responsive turbocharger is packed full with hi-tech and groundbreaking features – in the dual-injection system, the gasoline direct injection is complemented under partial load by manifold injection. Its optimum set-up reduces fuel consumption and particulate emissions. Cylinder fill is always in the optimum range – the camshafts are adjustable, with the valve lift system regulating opening on the exhaust side. The exhaust manifold is integrated into the cylinder head and is part of the intelligent thermal management system. A new kind of coating on the aluminium pistons and the bearings keeps friction to a minimum. The CUPRA efficiency package also includes the start/stop system and brake energy regeneration. CUPRA has always been synonymous with outstanding dynamics, precise agility and amazing sporting character. The new Leon CUPRA, however, manages to set the bar a good deal higher – in every dimension. With the DCC dynamic chassis control, front-axle differential lock and progressive steering all fitted as standard, the new Leon CUPRA achieves considerably faster laps on the track than its already impressive predecessor. At the same time, it is significantly more relaxed to drive, with a surprisingly refined level of comfort even on long motorway journeys. Safe and reliable deceleration comes courtesy of the CUPRA-specific, high-performance brake system, recognisable by its red callipers. The key fundamentals of the dynamics are low weight and a stiff structure. The systematic lightweight design of the new Leon family is also evident on the CUPRA. Despite considerably improved equipment, the new generation weighs 55 kilograms less than its comparable predecessor. The new generation of the DCC dynamic chassis control developed specifically for the CUPRA is even more sensitive and responsive, adapting the chassis characteristics to the prevailing conditions in a matter of milliseconds. The same applies to the driver’s preferences – the CUPRA Drive Profile permits extensive individualisation of the ride. The ESP handling system has been further developed specifically for the CUPRA and enables a very sporty driving style with full retention of safety functionality. For extremely dynamic use, such as on a race track, it can also be deactivated in two stages – the first stage deactivates the traction control and puts the ESP into sport mode, permitting greater yaw angles. The second stage deactivates the ESP completely. The CUPRA Drive Profile enables the characteristics of the new Leon CUPRA to be adapted across a very wide range to meet the individual preferences of the driver. Alongside the Comfort and Sport modes, the CUPRA mode was, of course, a focal point for the engineers in Martorell. Throttle response is particularly sensitive in this setting, while the DSG operates in its sportiest shifting mode and the sound actuator supports the full tone of the turbocharged engine. DCC dynamic chassis control, progressive steering and the front-axle differential lock also operate at their sportiest settings. Emotional design is a great strength of the Leon family. For the new CUPRA, this has been developed one step further. The new front end with its large air intakes and full-LED headlamps ensures a powerful look, as do the rear skirt with its diffuser effect and the two oval end pipes. The alloy wheels are exclusive to the CUPRA, while the red brake callipers and tinted side and rear windshields underscore its individuality. The focus of the interior is on the CUPRA sports steering wheel in its own unique design complete with shifting paddles for the optional DSG transmission, as well as the top sports seats in dark grey Alcantara finished with white stitching. Black full-leather upholstery, likewise with white stitching, is also available. For extreme lateral grip, there are optional bucket seats. The pedals and entry sills are made from aluminium. The Leon CUPRA also states its position as the top model in the SEAT range through the progressive steering, dynamic chassis control, front-axle differential lock, CUPRA Drive Profile and high-performance brake system with 18-inch wheels (CUPRA 280: 19-inch). SEAT is the only company in its sector with the full-range capacity to design, develop, manufacture and market cars in Spain. A member of the Volkswagen Group, the multinational has its headquarters in Martorell (Barcelona), exporting more than 80% of its vehicles, and is present in more than 75 countries. In 2012 SEAT had a total turnover exceeding 6 billion euros, with overall deliveries amounting to 321,000 units. 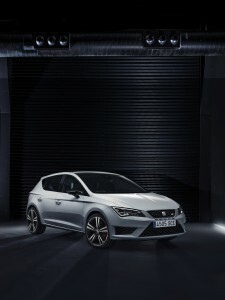 SEAT Group employs 14,000 professionals at its three production centres in Barcelona − Zona Franca, El Prat de Llobregat and Martorell, where it manufactures the highly successful Ibiza and Leon, amongst other models. Additionally, the company produces the Alhambra in Palmela (Portugal), the Mii in Bratislava (Slovakia) and the Toledo in Mladá Boleslav (Czech Republic) at Volkswagen Group plants. 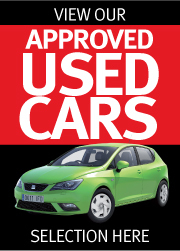 SEAT Ireland recently announced its total sales figures of 2,190 units for 2013. In the last 12 months, SEAT has increased its sales by 64% to confirm its place as Ireland’s fastest growing car brand. This phenomenal year-on-year growth now gives SEAT a 3% market share.